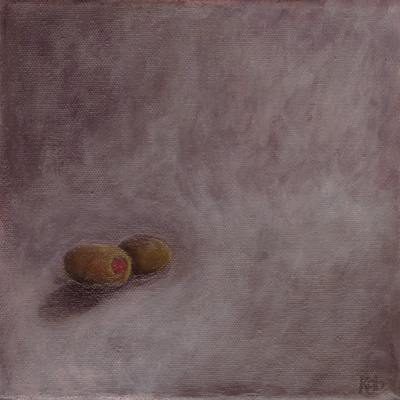 This painting of two olives is my 3rd daily painting and if I were being honest, it’d be called Motherf#cking Olives. This deceptively simple painting took me close to 8 hours to complete & I must have repainted the background a dozen times. I wanted to practice the concept we worked on in my last painting class – using a complimentary color as an underpainting to get the subject color to really pop. So, I started off with a bright orangey-red background, then painted over it with whites & grey to lighten it a bit. But, since I was just trying to bang out a daily painting before delving into other work, I didn’t wait until the red was completely dry. So it went pink. A really awful shade of pastel pink. More black, more glaze, more white, a little green, a little yellow…tada! Wipe the whole thing down because now the paint is getting impasto thick. Start again. Gargh!!! There is so much glaze on the olives that they glisten & shine wetly, juicily in person. In the scanner, however, shine is what one who’s just spent 7 and a half hours painting two tiny olives might call a motherf#cker. The grain of the canvas positively sparkles when lit by the scanner’s bright blue light and it makes the resulting image appear to have a ton of highlights actually painted on with white paint. I tried to tone down the contrast as best I could, but…yeah. Motherf#cking olives. All of this has got me thinking just what exactly is the point of my daily paintings experiment. As a business model, it’s not a bad one. Paint something new each day, something small that doesn’t take a lot of time, scan it, list it for sale and then work on the marketing side of being an artist (which is, sadly, more important than real talent when it comes to paying the bills). Develop a decent following of folks who would love to own original art, but can’t afford insane gallery prices, and one could earn a decent living without ever having to charge more than $150 or $200. There are several artists on eBay doing just that. The problem for me is – I don’t particularly WANT to paint tiny still lifes. I like painting my girls. I love to create characters, coming up with their personalities and life stories in my head. Even if that work never sells, that’s what I enjoy painting the most. I don’t dislike painting still life exactly; I have a list of cool subjects that I would really like to paint and would also really like to display in my own home. My old Poloroid camera, for example, or my typewriter. But those paintings will have a fair bit of detail and will take several hours to complete. If I paint subjects like that every day, I won’t ever have time to paint anything else. And that’s the real problem. My idea of daily paintings was more to make sure I paint every day, to practice painting subjects I don’t usually paint, and to (hopefully) make a bit of money. Since I have no attachment to the still lifes, I can price them low. There’s no sense of loss like with paintings I’m attached to. With all this in mind, on Friday morning I woke up bright-eyed and bushy-tailed and I set out to do a quick daily painting since I hadn’t had time to do one the day before. (I’d been working on a homework painting for class, so I did paint, but nothing worth scanning & showing.) I had tons of other work I needed to get done too: I have to recreate my Snow White painting for a client. I’m working on something new for Valentine’s Day. Plus I have another idea for a girl with a beehive ‘do that may end up at a local salon. Oh, and I have more homework. So. Busy day! Lots to do. What would be a good subject for a quick and dirty daily painting? Hmmmm. After looking around my kitchen, poking around the fridge (we really need to go grocery shopping, btw), it came to me – olives! How hard could that be?